We were in Upper Teesdale last weekend for one of our regular walks through the reserve, hoping to catch an early glimpse of the spring gentians (Gentiana verna) for which Teesdale is famous (see “Blue skies and blue flowers in Upper Teesdale …”) but, before we got to the sugar limestone grassland where these live, we had to walk along a length of the Pennine Way from Langdon Beck towards Cauldron Snout. After a cold, wet spring we have had a period of warm, dry weather and we were walking under blue skies in shirtsleeves. Puddles, unusually for this part of the world, were a rarity and, stepping across one of the few that persisted, I noticed a cloud of tadpoles. 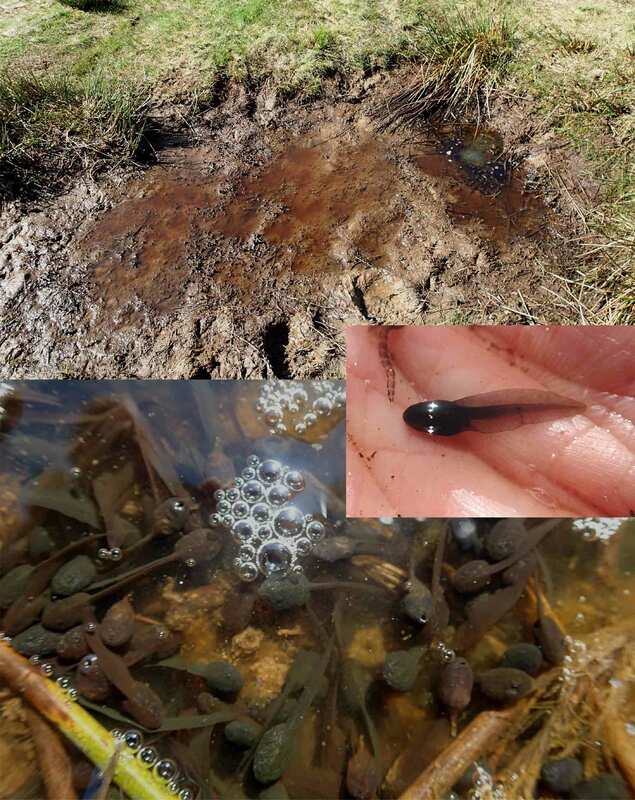 Now frog spawn and tadpoles are quite common in Upper Teesdale at this time of year and barely deserve a second look. However, the water in this particular puddle had a reddish-brown tinge of a slightly different hue to the mud around the margins. This suggested to me that it was probably some kind of algae and that it might be worth taking a small sample in order to see what the tadpoles were feasting upon. A puddle straddling the Pennine Way in Upper Teesdale with the cloud of tadpoles at the right hand side. The reddish-brown colour is caused by Trachelomonas. The lower picture and inset show close ups of the tadpoles (about a centimetre long) feeding on algae. Once I had a drop of this suspension on a slide and peered through my microscope, the nature of the coloration revealed itself to be a mass of tiny almost-circular cells moving rapidly across the field of view. Taking the magnification up yet further revealed these cells to be Trachelomonas, a relative of Euglena (see “More from Loughrigg Fell …”). Cells of Trachelomonas are enclosed in a rigid case called a “lorica”, which means that the cells are not constantly changing shape, as is the case for Euglena. This lorica, in turn, is often impregnated with iron and manganese salts, which impart a reddish-brown tinge seen both in the micrographs of individual cells and in the colour of the water in the puddle. Like most species of Euglena, Trachelomonas has a single flagellum, which emerges from the lorica through an apical pore surrounded by a “collar”. I’ve included a link to a YouTube video which shows the movement of individual cells. The lorica can be ornamented with warts, granules or short spines and these can be used to differentiate the species. Trachelomonas from a puddle straddling the Pennine Way in Upper Teesdale. The upper photograph shows the reddish-brown tint that the cells impart to the water in the puddle and the lower photographs show individual cells. The flagellum is particularly clear on the cell second from left whilst the ornamentation on the lorica is obvious on the right hand cell (possibly a different species). Scale bar: 20 micrometres (= 1/50th of a millimetre). A short video of Trachelomonas illustrating the mode of movement, powered by the single flagellum. This video was taken the day after the sample was collected, by which time many of the cells had ceased movement. Fifty-five species of Trachelomonas have been recorded from Britain and Ireland, along with 15 forms and varieties. Curiously, County Durham is a “hot spot” for this genus, with ten species recorded from Cassop Vale, just a few kilometres from where I live, and six from Croft Kettle (both locations have been the subject of posts on this blog). The reason for this is, however, rather prosaic: when the Freshwater Algal Flora of the British Isles was being written, there were no UK-based experts on several groups of algae, including the Euglenophyta (see “An inordinate fondness for … algae”). Konrad Wołowski, a Polish specialist, was invited to write the chapter for this group and was flown over for a trip around the country to get to know the British Euglenophyta flora. One of the stops on this tour was Durham, where Brian Whitton introduced him to local sites. As ever, when examining the distribution of the less conspicuous members of plant and animal kingdoms, one has to ask whether a “hot spot” represents a genuine biological phenomenon or is simply the result of intensive activity by one of the few people who know what they are looking for. 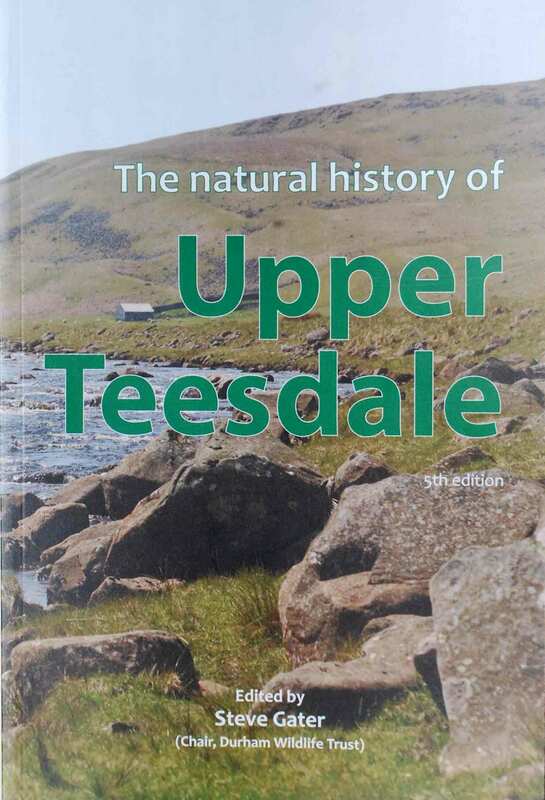 By the way, if you are interested in the natural history of this area, it is worth digging out the latest version of The Natural History of Upper Teesdale, which has just been published by Durham Wildlife Trust. 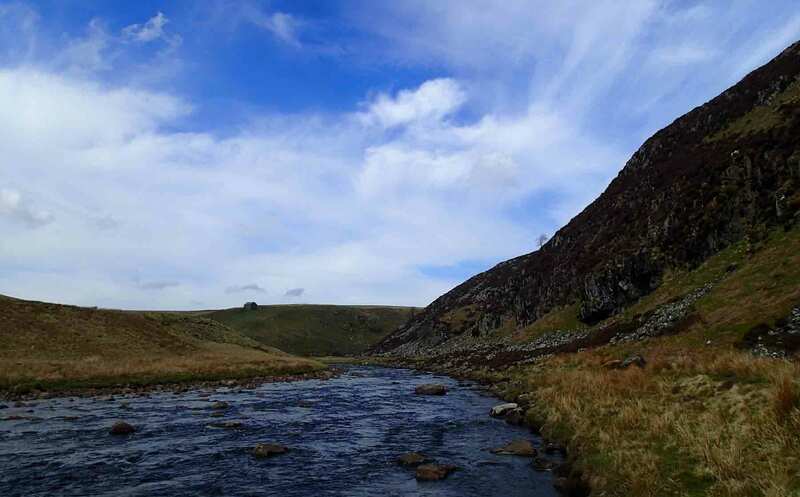 I contributed to the chapter on freshwater life but there is much here about all aspects, from geology and geomorphology through to the “Teesdale rarities” and the people who live in the dale. You can find more details here . Gater, S. (2018) (editor). The Natural History of Upper Teesdale. Mosaic, Middleton-in-Teesdale / Durham Wildlife Trust. John, D.M., Whitton, B.A. & Brock, A.J. (2011). 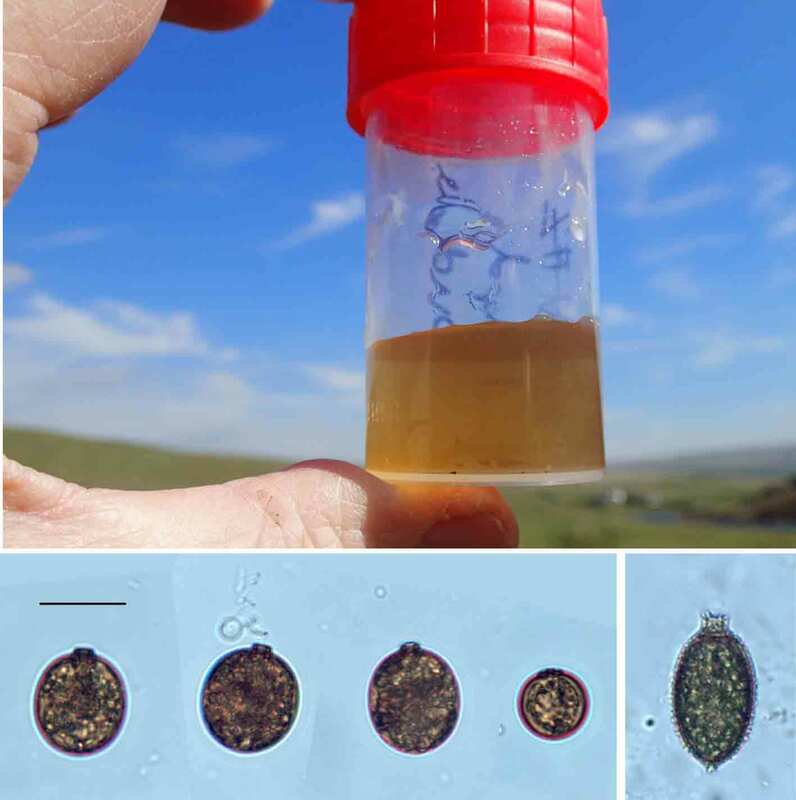 The Freshwater Algal Flora of the British Isles. 2nd Edition. Cambridge University Press, Cambridge.